Pineapple is known to be a delicious fruit used and many kinds of dishes desserts and drinks. Many people love it regardless of those who are against including it as pizza topping. But very few people are aware of the health benefits that is possesses. A lot of fruits have beneficial properties and pineapple is not an exception. Health beneficial fruits should be included as part of a well-balanced dietary plan since they help avoiding chronic disease. Bioactive compounds are part of functional fruits and this is why they are considered an incredibly healthy option for food. When eaten as part of a healthy daily diet, fruits and vegetables provide you with tons of health benefits. Bromelain is an enzyme that can be found in pineapple. The benefit of bromelain in pineapple is that it helps breaking down protein in the system. 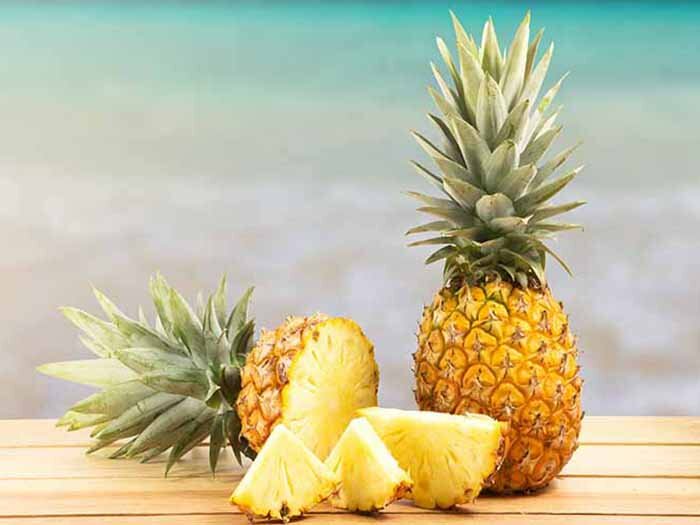 Additionally, bromelain enzyme helps people who suffer from osteoarthritis and similar condition by easing their pain due to its anti-inflammatory properties. Bromelain is not found in the fruit part of the pineapple but in its stem. So, it is suggested to take vitamin supplement along eating pineapple in order to enjoy of enhanced health benefits. Free radical damage is avoided with vitamin C which is also found in pineapple besides bromelain. In addition, vitamin C has the property of promoting the proper functionality of the immune system. Pineaple has proven to have a lot of benefitial properties so far. However, this is just part of it, since it is also a great source of vitamin A as well as beta-carotene. Vitamin A as well as beta-carotene is well-known for having antioxidant properties. Moreover, vitamin A alone has some amazing properties. It is vital for skin, vision and healthy mucous membranes. And another element that makes pineapple an excellent healthy choice as food is the fact that it contains manganese. Manganese is an amazing element that essentially helps in having healthy bones by providing the system with the required properties for their maintenance and this is not all if it. Manganese is an excellent aid for the energy production process and it also has antioxidant properties just like Vitamin A and B which makes it great for antioxidant defenses. Manganese also has a very helpful element called thiamin which is also known as vitamin b1. Vitamin B1 also helps with the production of energy meaning that by eating pineapple you will ensure a good supply of energy that you will certainly need for your daily activities. Finally, we can say that pineapple is an excellent way of keeping your body healthy. You can eat it as part of many dishes, as dessert as well as delicious beverages. Needless to say, it is a great idea to combine it with a lot other kinds of fruits and vegetables to make sure that you receive all the benefits needed for keeping your body healthy.